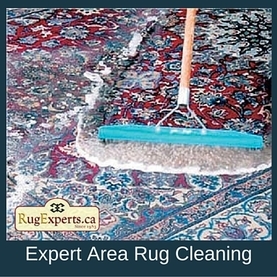 Washing, Repairs and Restoring Persian and Oriental Rugs for Over 30 Years. To protect their value and beauty, Oriental Rugs should be washed and rotated on regular bases. Proper washing will remove harmful dirt from deep within the pile and will bring new life to all those glorious colors. We've been washing oriental rugs for over 30 years. You can count on our experience. Allow up to two weeks for the washing process. 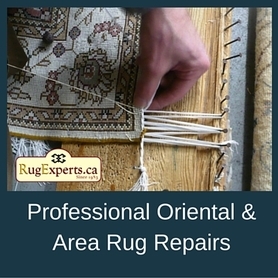 Repairs to Oriental Rugs should be done at the earliest possible stage to prevent serious damage. Left unattended, the damage will escalate quickly, reducing the value of your rug. Our qualified staff are able to undertake any repairs or restoration using 16th century techniques. Fringing, Binding, Re-weaving, color correction and stain removal. 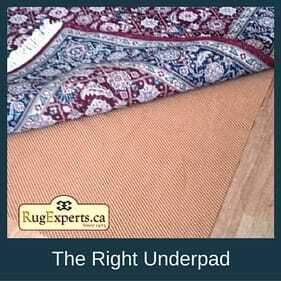 The right underpad will hold your rug firm to the floor preventing slipping and sliding. Also, underpad helps protect the knots by creating a cushion between the rug and the floor increasing the life of your carpet. Our sanitizes pad is made for oriental and area rugs and will not stick to the floor or your carpet. ​Underpad should be changed every 5 to 10 years. 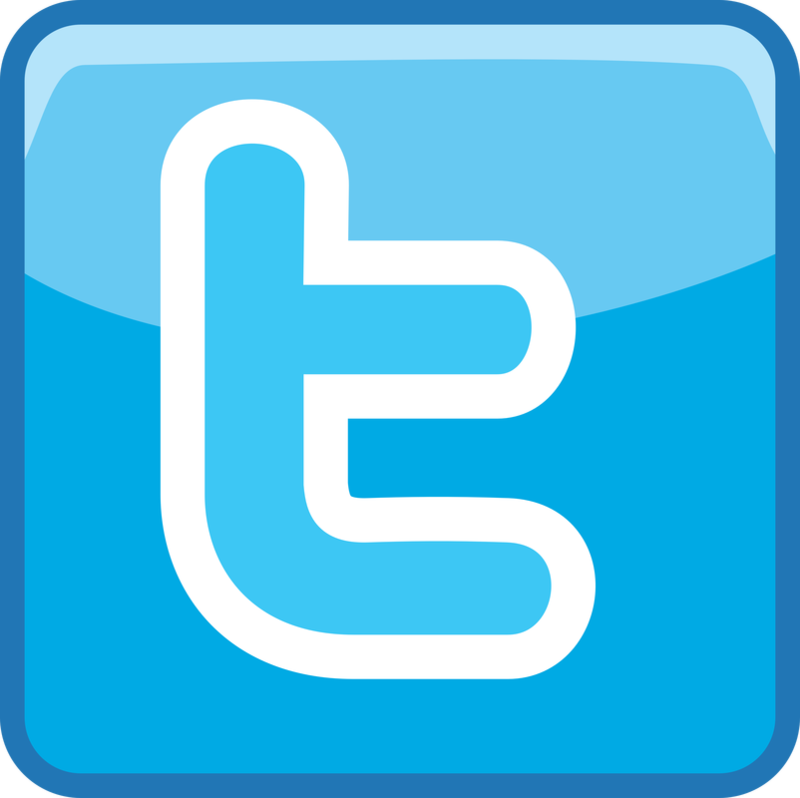 Call us anytime for a no charge, no obligation estimate. You will find our detailed quote to be fair and honest. 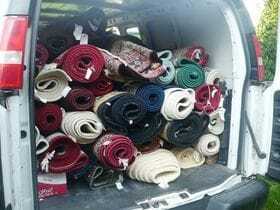 We pick-up and deliver across Windsor, Chatham, London and St. Thomas Ontario once a week. Heavy furniture or a tight spot are no problem. Just leave the lifting to us. In the last 30 years we've seen it all. 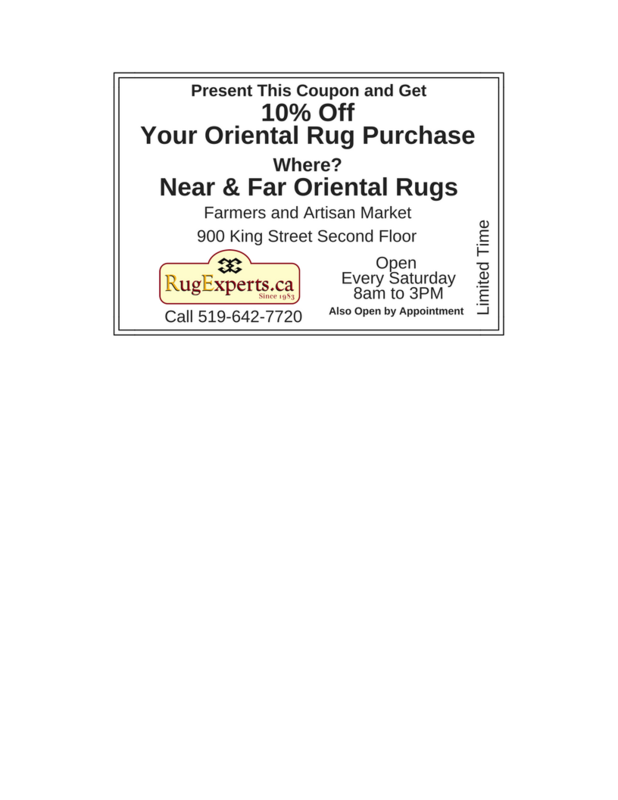 Looking for an oriental rug? Get an additional 10% Off our huge selection of handmade area rugs. 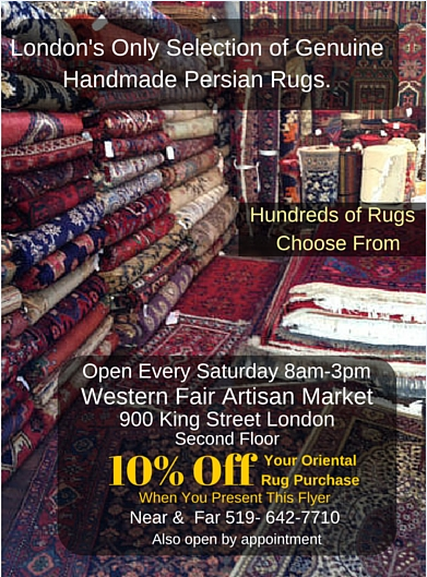 London's only selection of handmade Persian rugs. Download the coupon and visit our booth at the Artisan Farmers Market at the Western Fair. We are located on the second floor. Open Every Saturday 8am-3pm. Click Here for your 10% off coupon. Get the latest special and upcoming events.